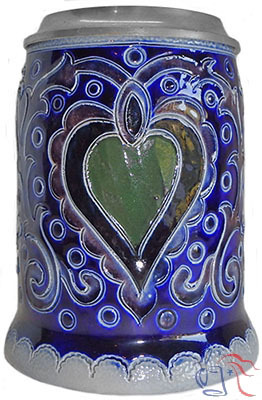 Stoneware, hand-incised, 0.5L, pewter lid. Design attributed to Karl Mahler. 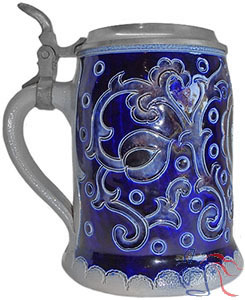 This stein and at least sixteen other hand-incised models bearing 9000 series markings were first shown at “The Bavarian Trade Show Munich 1912”. Although available documentary evidence leads clearly to the conclusion that the designs were originally created for Merkelbach, all currently known early examples were offered for sale through the Steinzeugwerke marketing consortium bearing base markings attributable Reinhold Hanke. Production appears to have ceased at about the same time that Hanke withdrew from the consortium in 1913. Some of that same group of Mahler designs, including the example shown here, were reintroduced in the 1950s through 1970s as part of the Merkelbach product line.